The modern style has crawled into the hearts of many people worldwide – and with good reason, too. Always presenting a design of clean lines, neutral tones, and an asymmetrical balance in layout, the modern style is for those of us who require a particular look that is somewhere between lavishness and minimalism. 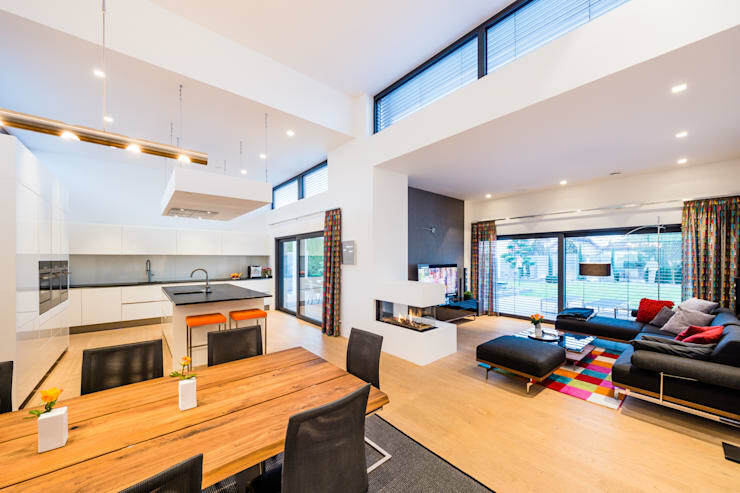 Such is the space we are about to discover here on homify 360°, which treats us to all of the above, and then some. But although its façade is the regular beauty you would expect from a contemporary creation, it is the house’s use of colours and furniture pieces on the inside that made our jaws drop. 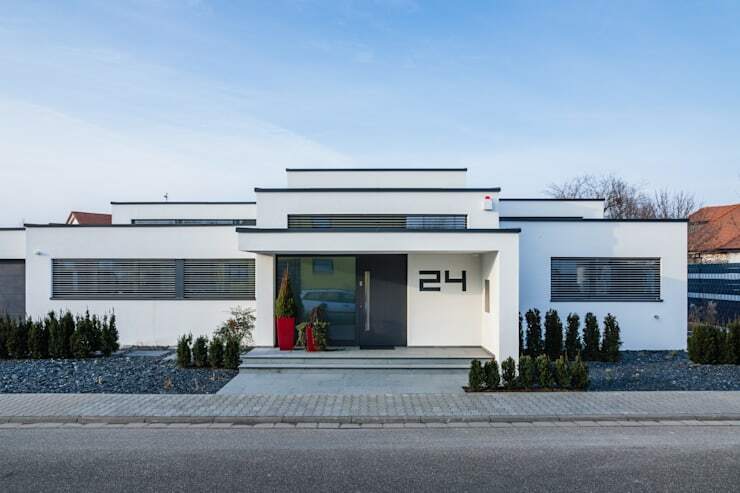 Although the house’s façade presents the regular block-shaped design we have come to expect from modern designs, it is the way it is all laid out that flaunts a unique look. It is almost as if the house is building up, like it is in the process of growing upward – notice the volumes receding further and further while slowly ascending. To make this effect more powerful, dark blue tones where chosen for the rim of each volume, neatly framing each shape and stopping the dominating whites from bleeding into one another. Most definitely a structure that makes a strong visual impact (especially when combined with those two strikingly hot-red potters outside), and we haven’t even set foot inside yet! A house that is built with such precision would look rather weird if paired with a natural-growing and boundless garden. Fortunately, the green space located at the rear side looks just as painstakingly planned as the main structure. 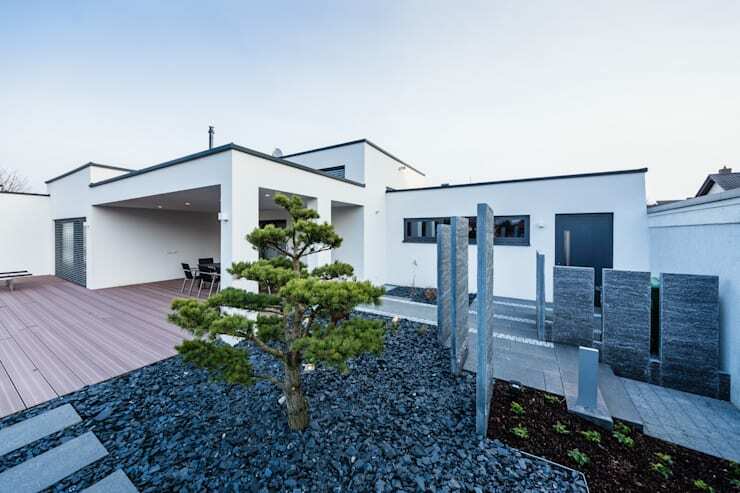 A wooden deck adorned with pale timber panels crawls out of the house, leading to the garden where a selection of charcoal-toned stones dominates the garden. Bits and pieces of fresh greens are inserted via a tree and some young plants, adding just a touch of nature to this neutral-dominant space. The neutral colour palette leads us inside, and immediately switches course to a warmer, charming look. Caramel-coloured flooring replaces the cold steel-toned surfaces we saw outside, while a decadent selection of downlighters add the necessary sparkle to the spaces. It is impossible to overlook the beautiful selection of jovial colours inserted in the living room: bright blues, reds, pinks, and oranges float out of the living room, but it’s only a touch of the orange that reaches the kitchen stools while the rest hold back. A timber dining table dishes up an eye-catching spot for dining, contrasting superbly with the crisp-whites and darker tones that surround it. Sharing in the open-plan layout of the socialising area is the kitchen, located a hop and a skip from the living room and dining area. It is clear that the family who occupies this house has a passion for the culinary arts – why else would there be three ovens? To further enhance our interest in the kitchen, a spacious island takes centre stage, providing a decadent area for working, cooking, and informal dining, as well as numerous storage possibilities. 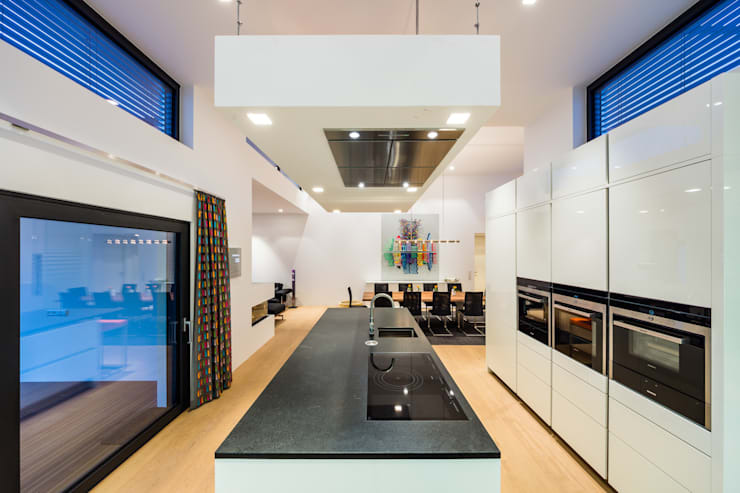 From lighting designers to kitchen planners, we have them all here on homify, and much more. Check out our professionals page. We have saved the best for last – the dream bathroom that is ultimate perfection. Flaunting the same warm neutrals as the other interior rooms, the bathroom gets treated to a spacious layout too, as well as some fabulous lighting pieces. But our favourite spot in here? Definitely the sauna on the left, immediately cancelling out the possibility of any member of this family requiring a trip to an overpriced spa. In addition to these luxuries (check out that tub demanding our attention like a lit-up runway), the bathroom also presents adequate space for storage, as well as areas to display numerous décor pieces and other accessories. And just have a look at that wall mirror with its backlighting, ensuring that any time spent in front of it (whether it’s applying makeup or brushing teeth) will make one feel like a Hollywood star. Most definitely not your average modern-styled suburban home! Don’t miss these Simple ideas to modernise your bathroom – they are well worth a look! Love it? Hate it? Tell us how you feel about this house.